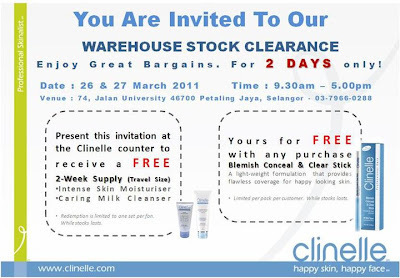 Main thing that attracted me to this sale was Clinelle! Really super cheap stuff here! But be careful.. Make sure you check the expiry date. Some are in May! After some Googling, I found out that there's actually more! ^_^ I remember seeing Vico, honey, pet shampoo etc, chocolates (Kinder Bueno & Fererro), sanitary pads, hair wax, mousse (Tresemme), shampoo, conditioner, baby stuff, Tupperware, Morgan, Babyliss hair stuff, M&Ms, Elgy, hand wash, body wash and body powder. Can't recall the other stuff. It's super packed though. I would suggest parking in Jaya One and walking there as it's really near.